I spent time over the year giving back because I do have the good fortune of having an Army Officer husband and I work as well. Throughout the year, I have donated three of my daughter's clothing to a church and also FreeCycled in hopes of those clothes going to needy people. This past summer, we gave a host of baby products such as walkers, bouncy chairs and many other things to a needy pregnant couple. We then gave away an almost new washer and dryer to the same neighbor who is a minister in a small church in South Carolina. It's a great feeling to help others in need especially when you have been given good blessings. TwitterMoms and Robeez wants to know how you and I are giving back this holiday season. This Christmas, I have adopted a child from the Angel Tree, I have provided presents for my elderly, fixed income parents to give to their grandkids, I have sponsored a couple of my own blog giveaways in hopes it's going to someone who really needs the help, I'm writing Santa letters for my daughter's class and expanding it to the siblings as I learned one child's father is in Iraq and another is fighting injuries sustained in the war and has been away for two years recovering from his children. We have yet to sort through the old toys to give those away which most are like new and some still have tags. This is a great way to spread the desire to help others. Stride Rite Children's Group, part of the Stride Rite unit of Collective Brands, Inc., markets the leading brand of premium children's footwear in the United States under such brands as Stride Rite®, Saucony® Kids, Sperry Top-Sider® Kids, Keds® Kids, Robeez® and among others. For 90 years, the company’s passion for excellence in design has been focused on ensuring the proper development of children’s feet with a commitment to innovation, research and technology. What I like about Robeez is the fact that Robeez will donate a pair of soft sole shoes to K.I.D.S. with every soft sole purchased through December 23rd and link to: http://www.robeez.com/EN-US/seasonofgiving.htm. 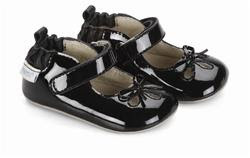 My favorite holiday shoe is the classic patent black shoes. There is just something about Mary Janes and how elegant and classy they look. The great thing is they are approved by the American Podiatric Medical Association. These are also my favorite. 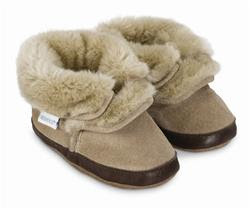 The Robeez Cozy Ankle Booties - tan in color are the ultimate in comfort, this plush ankle bootie is so warm and cozy that your little eskimo will want to wear them day and night, indoors and out. Whatever the reason, it's always good to give back wherever you can. Whether it's cash, new items, food or used items, someone needs something. This is a great thought provoking blog request and I hope everyone embraces the challenge to think about what you are doing to give back. If you are one of the one's in need, may your wishes be answered and good time start to follow. Thanks TwitterMoms and Robeez for this great opportunity to spread the word. Have you entered any of my giveaways? Get five bonus entries for each and every giveaway you enter for telling me in this post what you have done this Christmas season or will do to help someone else!